MONUspa is a professional range usually only found in salons but now with an opportunity for you to experience at home for yourself. 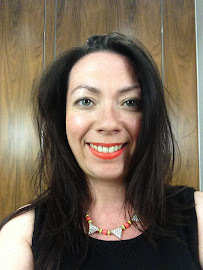 I was sent a few items from the bodycare range to try and am able to share with you today. First up was the MONUspa Instand Radiance Body Buffer Body Scrub* which I am in love with. I recently posted about my love of Soap & Glory Body Scrubs but this one is something special. I don't know how to describe teh scent other than 'spa like' which I hope doesn't sound completely ridiculous. One whiff as I open the tub and I'm transported. Whilst I enjoy a bath I'm not one who enjoys spending hours luxuriating in a bath but this product could tempt me to change my ways. It is delicious thick and creamy with enough 'grit' or in this case 'crushes walnut pieces to buff away any dead skin. Ingredients such as Papaya Enzymes leave skin as radiant as the name suggests. It's pricier than high street alternatives at £25 buts it'sdefinitely one to use for pamper days and far cheaper than a visit to the spa. It was only last weekend my mum and sister in law were discussing how body lotions seem to be the product we amass the most of yet never seem to finish so they're often not something I get too excited about. As such I gave a cursory glance to the Monuspa 5 in 1 Super Sculpt Body Lotion*, test it for this review and add it to the pile. But no, again I'm feeling the love and it's shifted others out of the way and made it's way on to my dressing table. Again there's that 'spa scent' and a bottle that doesn't seem daunting in size with a handy pump for dispensing. This is another pricey product at £39.99 which I can't imagine my spending but I can understand why others would. It's selling point is the '5 in 1' claim. Active ingredients claim to live and tone problem areas, reduced the appearance of unwanted cellulite and 'visibly tone and tighten and feel firm'. You'll also be tackling uneven skin tone, brightening the complexion and fighting signs of premature ageing by reducing the appearance of fine lines and wrinkles. An awful lot of claims wouldn't you agree. I don't think any body lotion, no matter what the price tag is going to banish the sight of my cellulite but it is certainly a lovely product to use and felt more special than my typical body lotion. Finally there is the Monuspa Hand & Body Protector SPF15*, again housed in sleek packaging with my favourite pump dispenser. It's another thumbs up from me, so much so I took this straight into work after testing and photographing at home so it could sit on my desk at work. I probably take better care of my hands than I do any other part of my body. No matter where or what I'm doing I'll also make time for hand cream. That said I'm not always conscious of the SPF content of my hand creams and whilst on a day to day basis you could argue that I can get away without applying on my body if wearing tights or such but my hands are always exposed to the elements. As I have noticed with all MONUspa products there is a multitude of ingredients and in this instance to ensure protection from the sun. Zinc Oxide has been 'micronized' so it will not leave a white cast on the skin yet still provide the physical barrier to protect your skin. It appears 'whiter' at first than typical hand creams but absorbs into the skin nicely. It's also a thick cream and I was sure it would feel heavy and sticky but all I'm left with is soft hydrated hands - and yes, it passes my 'famous' mug test. My only criticism which will apply to others is the lack of scent which is so appealing in the other products. Everyone knows you can 'judge the age of a woman' by her hands so you have Cassia Alata Leaf Extract to help reduce photo-ageing from the sun and Blackcurrant Seed oils to boost moisture levels and provide elasticity and supplements. 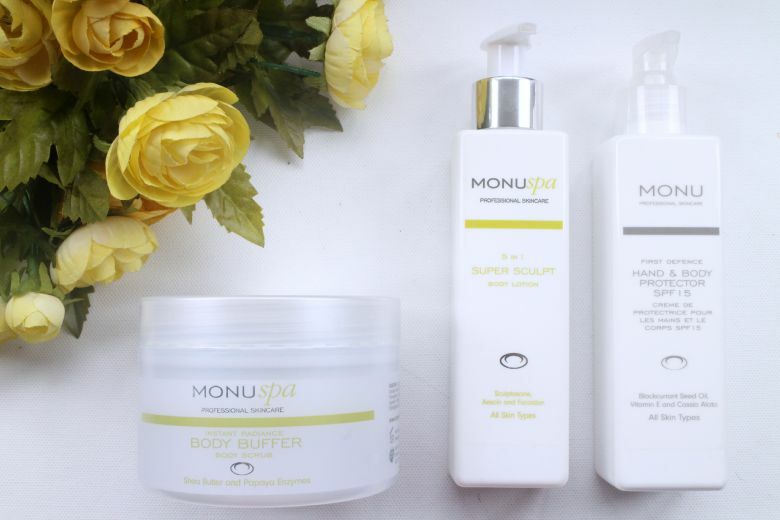 MONUspa is definitely a luxurious range worth having if you have the funds. 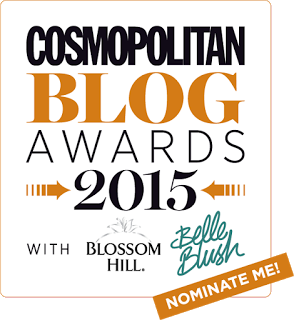 If you enjoy reading my blog posts it would be fantastic if you could take a moment to nominate me for the 'Best in Beauty' category in the Cosmopolitan awards here. I will love you forever! *This post contains press samples. Hi Victoria! We always love all the great info you give us about products we may not otherwise be exposed to. It's nice to have a source with great info like yours. Hope you've had a great summer. Can't believe it's over already, where did summer go? Stop by if you have time to take a look at our trip to Paris. We'd love to have you come visit! So glad you enjoy the posts, I'm the same when reading the reverse.